At Brookwood Dental Center each patient is served as an individual. We greet each patient by name as they walk into our front door and care for them as if they were our family. Our dedicated staff is prepared to spend as much time as the patient needs so all of their questions are answered. Dr. Clark graduated from Washington University School of Dental Medicine in 1984. After graduation he went into public health practice with the State of Missouri. In 1986 he started his own practice at Brookwood Dental. 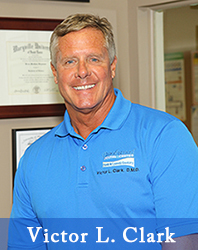 After successfully opening his first office, he acquired Carrollwood Dental Group. He is an active member of the I.A.O. and is certified in Invisalign. Dr. Clark believes in giving back to the community – our office gives out five high school scholarships to seniors who are interested in entering the health care field after graduation. In his time away from the office, Dr. Clark enjoys spending time with his family. His hobbies include golf, swimming and exercising. Dr. Bootsie grew up in St. Louis, MO and went to Mehlville Senior High School. She graduated from the University of Missouri Kansas City School of Dentistry. Dr. Bootsie’s philosophy is to treat each patient like family in order to realistically reach each patient’s goal and to provide them with the best oral care possible. In her spare time she enjoys the company of her young nieces and nephew. Born and raised in St. Louis, MO. 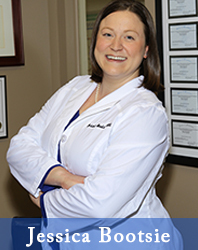 Dr. Stegmann received a Bachelor of Science degree from Maryville University and a Doctor of Dental Surgery from the University of Missouri, Kansas City, with an honors certificate in Endodontics. After graduation, he went into private practice with Brookwood Dental Group. Dr. Stegmann is an active member In the American Dental Association, Missouri Dental Association, Greater St. Louis Dental Society, Academy of General Dentistry, International Association of Orthodontics and International Congress of Oral Implantologists. He keeps up-to-date on the newest techniques and technologies by attending courses in cosmetic dentistry, implants, oral cancer screening, root canal therapy, oral surgery and porcelain crowns. Dr. Stegmann is also certified in Invisalign. 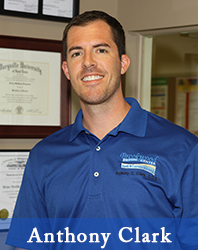 In his spare time, Dr. Stegmann enjoys spending time with his wife and three children, playing golf and coaching. Dr. Anthony received his Bachelor of Science Degree from Rockhurst University and his Doctorate of Dental Surgery from Creighton University in Omaha, Nebraska. As a member of the American Dental Association, Missouri Dental Association, Greater St Louis Dental Society, Academy of General Dentistry, and International Association of Orthodontics he is able to properly assess and treat each patient’s unique situation. 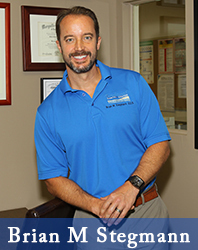 Dr. Anthony Clark strives to provide a healthy smile to all those he meets. He enjoys playing golf, exercising and spending time with his wife, dog, friends and his five brothers. It is our sincere hope that you find our office warm, caring and comfortable!